Overall, I think it is awesome how even my splits were from miles 1-8. The last mile was kind of an anamoly--it was uphill, and I was tired from the heat that I wasnt expecting. Overall though, I wanted this run to be well faster than recovery pace and it was. I like how even everything was. Was going to take today off, but the weather was so perfect that I couldnt resist an easy 3. 7:20, 7:15, 7:16 are my mile splits. 21:51 overall, for 7:17 pace. Felt nice and relaxed. 13x400 repeats today. Typical week of workouts for a race. Got a 5k this weekend, and I am trying to peak this and next week as my season winds down. Hit all my splits between 1:17-1:20 with equal recovery. Added up the total time and it was 17:00 for 3.25 miles which is around 5:14 pace. Should be a good weekend. Easy 4.5 miles today in 7:36 pace, finished in 34:11. Should be just beautiful weather for the 5k this weekend. Shooting for sub 17 again. Overall, it was a good tuneup and everything felt good. Its crazy how after running my mileage days slower the last month or two that 7:00 pace feels a little harder than it used to. I used to do this pace everyday, but to get more mileage I've slowed down and I didnt realize there was such a difference between a 7:45 mile and a 7:00 mile. Interesting stuff. Weather should be perfect this weekend, thinking sub 17 for sure, but shooting for a PR is my A goal for the 5k. easy 2 pre race systems check today. Getting pumped to run tomorrow, should be ideal weather 54 degrees with light breezes out of the north. Definitely want to PR if its possible. 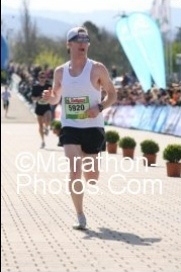 Fun race, great weather, fantastic people, just didnt like my performance. I will cut my mileage even more this week for next weekends 5k. Legs will prolly have more pop on less mileage next week. Also, signed up for my 2nd Living History Farms XC race on the 21st, pretty pumped, its always just a fun race! Overall a great run. I negative split this run by a lot, which was nice. I really got in a zone after 3 and just hit the cruise. 5k this weekend, its the community race that coincides with the heartland nike nationals meet, so it will be fun to get on an xc course again. Total-- 16:38 or around 5:20-5:21 per mile. Very good workout today, I was hoping to hit each 1000 between 3:20-3:30 and I exceeded that. 2:05-2:10 recovery between each. Oddly enough the added up time is exactly my PR for the 5k, pretty cool. 5 easy today. 37:00, 7:24 avg pace. Weather is still pretty good, especially for this time of year. High 50s and a little breezy and cloudy. Looking forward to my 5k this weekend. 4 easy today in 29:00, 7:15 pace. Thinking about a late spring marathon for my first. Mad-City on May 30th is the leading candidate right now. 2 miles easy in the cold november rain. Cue Axl Rose. Ran it in 14:31, 7:15 avg. This was my warmup for tomorrow's 5k, looking forward to it! I did not run well today at all. The race was awesome and the course was a lot of fun, but for some reason I just didn't run fast. Thats ok, cuz I had a blast running the Regional XC course, I think I am just past peak for the 5k. Prolly really need some time off and then to revamp. Will do that in later december. First mile was good--5:33, but the last two were both 6:05's with 36 seconds to close the final .1. Ran in my old xc spikes cuz I couldnt find my newer ones. Overall, a pretty disappointing time, but like I said, fun race for sure. Overall, a good run, negative split with a decent last mile. Felt pretty good once I got in the groove after the first few miles. Overall, I am really happy with that. Its sad, but todays workout was not far off my last weekend 5k splits. I dunno, maybe Im turning into a longer distance runner. I feel better the longer I go and I even started running faster that 4th mile today. It was especially crazy how easy the first mile felt, i had to consciously slow up otherwise I'd of easily hit 5:30. Overall, very evenly split run today. Not much else to say. Easy 4.5 today. Great weather again. Overall, a nice easy run for the day. easy 3 today in 22:22, 7:27 pace. Felt really relaxed and easy. Living History Farms off-road 7 mile xc race tomorrow, 7500 people running, it should be a blast like it was last year! Another living history farms off-road race today. I ran it last year and it was a blast. Completely off-roading, through corn fields, up monster hills/mud cliffs. 9 creek crossings. Ran it in my spikes which i found at home. Last year was freezing cold which made it challenging. this year the weather was a little better(mid 30s with fog), the water crossings were still cold and the race was just as challening. I finished looking like a mud monster--I couldnt get up out of one of the creeks and just got covered in mud in the process--priceless! I think the distance changes on this thing every year. Last year I ran it in 46 minutes and something and this year it was 50 minutes. O well, i dont really do it for time, just to have a fun off road experience. Its such a hard race! Truly takes it outta ya. Its neat though because 7000 people run each year, so to get 182 out of 7000 is pretty cool. Nonetheless, I had a blast this year and will try to come back next year for sure. They say the race is over 7 miles, but i have no idea how much past it, so i just ballparked it and said I ran 9 total with the mile warmup and brief cooldown. They always mess with the mile markers too, one mile (like number 4) i ran in 5:10 haha (definitely wasnt a 5:10, i wasnt running that hard), and then mile 5 was 11:10 (definitely not that slow), i dont think they even know haha, just place random mile markers. It was a pure guts running day today! Very evenly split run today, felt nice and easy. Overall, a pretty evenly split run again, at least through the first 7 miles. I did feel a little sluggish late in todays run and it shows in my latter mile splits. I felt good enough to close pretty well the last mile though. Today was 4 easy miles in 30:52, 7:43 pace. The legs were kinda sore today, and the cold and strong winds didnt help. Gonna hop in a turkey trot 5k tomorrow as a speed workout. Hopped in the local turkey trot today. Was gonna do speedwork today anyway, so i figured a race was as good as that. 120 other people showed up so it was a good turnout. It is always a low-key event, but there is always some fast outta towners that show up to win it. Started out and it was quickly just two high schoolers and I. I let them lead it for around 7 minutes, the miles werent marked and the course isnt certified so everything was by time. I surged up a huge hill and passed them both and left them behind. I accelerated through the last 10 minutes and won by 28 seconds with a 17:30, 5:38 average pace, well faster than I've ever ran this course before. Not sure any of my mile splits, but it felt even if not negative, and it felt really easy too, which was a nice bonus given I didnt do any sort of taper and just used it as a workout. It was very cold and windy too, so to win in a pretty decent time in those conditions was nice. I guess today I became that outta towner haha. I have run this race 3 times now, and have finished 3rd, 4th, and now 1st. Will definitely do it again next year because of the small town/laid-back atmosphere. Logged an easy 8 today in 1:00:28, 7:33.5 pace. I am super sore from playing football with my family yesterday, so I was definitely sluggish on the run. Will get in an easy run tomorrow then long on sunday. Overall, a good run, legs were kind of tired towards the end, probably because I have ran more this year in total than I ever have before. Will definitely take an extended taper the week of the half. Other than that, I feel like Im still in good shape.